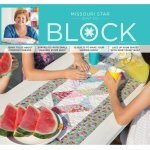 BLOCK by Missouri Star Quilt Company is a magazine they design, produce, and publish all in house at MSQC! There are no ads in it, not a single one. They take tutorials that Jenny has done on the youtube channel and write the patterns, then make the quilts out of new fabric and write stories and guides to go along with them. The 10 projects they've got in this issue for you are just like summer, fun and bright! You'll be so inspired by the fantastic new blocks and colors, your summer won't only be filled with sunshine, but with all the smiles your creations will bring. We are located in central Ohio about 18 miles east of Columbus. Closed Sundays and most national holidays.